I have to say that I never really thought anything about my mum being short, it’s just the way she is. But that all changed when she came to me asking which was the best exercise bike for short person. It was only then that I realized the challenges faced by shorter people when trying to get back into shape or simply stay in shape. I immediately made it my mission to discover the best folding exercise bike for short person; folding is an essential part of the equation as my mum doesn’t have the room to keep it out all the time. Thanks to a friend who runs the local gym I was able to deal directly with a few suppliers and test their products. I’m actually quite surprised by the range available but I’m in no doubt that the Exerpeutic 400XL Folding is the best of the bunch. It offers excellent value, a full range of features and is easy to fold away; that’s perfect for my mum and the reason it wins the best folding exercise bike for short person award. It’s also very easy to get on and off; that’s an essential factor when you’re hovering round 5ft tall; you can’t swing your leg over a high bar unless you’re already a gymnast. Of course exercise is only part of the equation if you’re trying to lose weight. 4 Ready To Get The Best Folding Exercise Bike For Short Person? The Exerpeutic 400XL regularly tops many different polls and with good reason. It’s a semi-recumbent bike which makes it good for those with back or knee injuries. The price is affordable but the product is not cheap. Perhaps most important is the fact that the company behind Exerpeutic exercise bikes is Paradigm; a company known for its commitment to the best quality products. When choosing the best folding exercise bike for short person it is essential that the bike is easy to fold. This is definitely true of the Exerpeutic 400XL. All you need to do is slide two pins out of the frame. You can then bring the legs together and move the computer post downwards. To finish slide the pins back into position and it’s locked into the folded position. When folded it measures 54” x 17” x 20”. Then it’s as easy as tipping it onto the back legs where there are wheels to help you slide it across the floor and into your cupboard. You’ll be surprised where it will fit. This bike may only weigh 39 pounds but it is designed to take up to 300 pounds. It will remain surprisingly stable as you ride it and with the seat just 24” from the ground and only 21” to the handlebars almost anyone can ride this machine. The screen on the bike is simple but effective. It will tell you your distance, speed, time exercised, calories burned and heart rate. You’ll need to have your hands on the sensors in the handlebars to monitor your heart rate. You can manually cycle through the info or you can leave it to scan through at its own pace. The seat can be moved up and down and back to forth; helping you to get the best possible position on your bike. The fact it is a semi-recumbent allows you to get the benefits of upright cycling while having your back supported. There is also an adjustable knob in front of the seat that allows you to adjust the resistance while you’re riding. This is easy to do and surprisingly accurate. The level of resistance is controlled by a magnetic pad and how close it is to the flywheel. The bike uses a V belt which is exceptional smooth and makes nearly no noise; allowing you to watch television as you ride, if you wish. No bike is perfect and there are a few very small issues with the Exerpeutic 400XL; but these are fairly minor. It is disappointing to note that the back of the seat is not adjustable. It is set at a slight angle to encourage the recumbent position and most people find it is perfectly adequate; my mum included. But there are those that have struggled with the seat; making the back adjustable would make a big difference. If you’re dedicated and use the Exerpeutic 400XL on a regular basis it is likely that the V belt will start to squeak. Unfortunately there is not a lot you can do about this. The information on the screen should be seen as more of a guide than factually correct. However this is largely irrelevant as the screen is not back lit; making it very hard to read in poor light. Marcy is a brand of exercise bike marketed by Impex; who started trading in 1982 and are now recognized as a leader in the fitness field. They offer products in most fitness sectors and are proud to have some of the best products on the market. The first thing you’ll be impressed by on the Marcy NS-652 is that everything is adjustable. The floor to seat height is 33 inches; this is at the top end of acceptable for anyone round 5ft; but it’s easy to get onto thanks to the step through style. The seat moves up and down effortlessly and brings you closer or further away from the handlebars at the same time; depending on what you need. Of course it can also be folded away in a matter of moments. Simply release the pin and bring the legs together before sliding it into your cupboard. Once folded the bike is just 32” x 18” x 42”. Again you’ll be able to fit it into almost any cupboard. The Marcy NS-652 is fantastic if you want to keep a track of what you are doing. The display is large enough to be easily seen while exercising and shows you calories burned, speed, distance and the time you’ve spent exercising. Alongside this there is an adjustable resistance knob which has 8 different settings. The idea is that you can challenge yourself or others on different levels to push your body harder; increasing the benefits. This makes it feel much more like you’re riding outside. The bike weighs less than 40 pounds and yet it is very stable when being ridden. This is partly to do with the fact that the centre of gravity is so low. But it also relates to the quality of the design and the materials used to create it. In addition the design is very simple. This ensures you concentrate on what matters; exercising. Monitoring your heart rate is an important part of getting back into shape. It’s disappointing to note that the Marcy NS-652 doesn’t have heart rate sensor grips or the ability to link to a chest monitor. This is part of the reason it’s a runner up and not the winning bike. Although the NS-652 is not the heaviest of bikes it is still disappointing that there are no transport wheels. This would make it much easier to slide the bike away when not in use. As it is there’s a good possibility you’ll simply leave it sitting in the way; which will become frustrating. ProGear is actually an Australian company that specializes in providing high quality bikes for road and trail use. More recently they have moved into the fitness market and their exercise bikes are proving to be quite a hit. 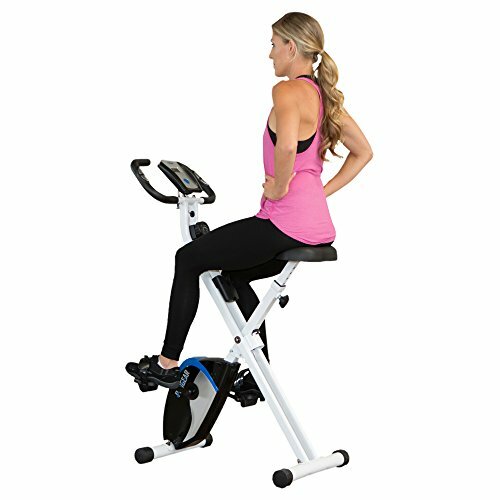 The ProGear 225 foldable exercise bike is for anyone looking for a compact exercise bike on a budget. It’s designed for people between 5ft 1” and 6ft; making t a top contender for the best folding exercise bike for short person award. 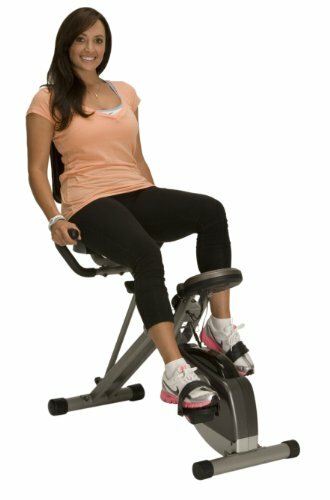 The basic design is simple and much like many other foldable upright exercise bikes, a simple ‘X’. However the ProGear 225 also features a dual transmission flywheel. In lay person terms this means there is the possibility to double the resistance and really make it difficult to ride. The dual flywheel also ensures that the ride is exceptionally smooth despite the fact that the bike is not the heaviest option on the market. Add to this transportation wheels and you have a bike that has been designed to be used and stored at home, no matter how small your place is. Folded it measures just 19” x 17” x 53”. The ProGear 225 has the same basic features as the other bikes on this best folding exercise bike for short person list. The best feature is the 8 resistance settings which are controlled via the knob below the screen. The resistance ranges from barely noticeable to tough enough for a proven athlete to struggle. That gives you plenty of scope to improve. The 3 piece cranking system and the dual transmission flywheel provide an incredibly smooth ride. You can adjust the seat up and down easily by relocating the pin. This also moves you closer or further away from the handlebars. The LCD screen displays the usual information; calories burned, distance travelled, speed, time and your heart rate. You do need to be holding onto the heart rate sensors to get your heart rate reading. The ProGear 225 can only handle 220 pounds; that the lowest rating of these 3 bikes and a real disappointment. While many people will already be below this weight ProGear are effectively penalizing those that potentially need the bike the most. None of these bikes actually have fitness programs or a way to record your data. This is one area where it would be great to see some improvement. After all, competing against yourself is a great way to improve your fitness level. Ready To Get The Best Folding Exercise Bike For Short Person? The Marcy NS-652 has a lot of potential, especially as it is so easy to jump on and get started. However, a few key issues such as the heart rate monitor prevent it from being the best folding exercise bike for short person. That award goes to the Exerpeutic 400XL; that’s why my mum’s now got one. What’s the Best Rowing Machine for Tall Person? Spin Bike vs. Exercise Bike: Which One Is For You?